"The basic pizza dough and sauce ready and waiting for your favorite toppings!" In a small bowl, dissolve yeast and sugar in warm water. Let stand until creamy, about 10 minutes. In a food processor, combine flour, Italian seasoning and salt. Pulse until mixed. Add yeast mixture, flat beer and oil. Pulse until a ball is formed. Scrape dough out onto a lightly floured surface, and knead for several minutes until dough is smooth and elastic. Allow dough to rest for 2 to 3 minutes. Divide dough in half, and shape into balls. Place dough balls in separate bowls, and cover with plastic wrap. Allow to rise at room temperature for about 1 hour, then store in the refrigerate overnight. To make the sauce: Heat olive oil in a saucepan over medium heat. Saute onions until tender. Stir in garlic, and cook for 1 minute. Crush tomatoes into saucepan. Add tomato paste, basil, parsley and oregano. Simmer for 10 minutes. This no-cook pizza sauce tastes just like the best takeout. If you have a bread machine, just mix on Dough setting, then remove and let rise after it kneads and rests. 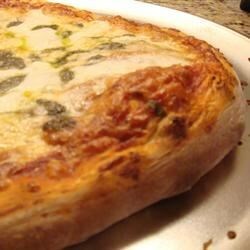 The dough can be frozen in plastic freezer bags in one-crust portions. Important: Thaw in the refrigerator. Hmmm can you substitute the flat beer with something non alcoholic, or cn it be made without? I don't have any alcohol, and Im not fond of it.